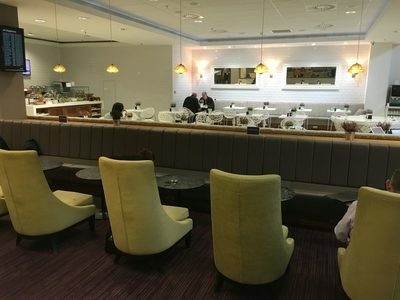 This article is my review of the No 1 Lounge at Edinburgh Airport. 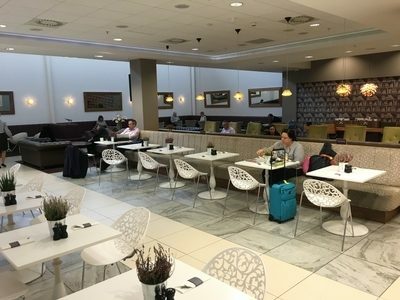 A long layover at Edinburgh Airport last week gave me a chance to take a look at three of the lounges – No 1 Lounge, Aspire (reviewed here) and the British Airways Galleries. I will take a look at all three over the next few days. You can learn more about the lounge on the No 1 Lounges website here. I like No 1 Lounges. There is something about their design aesthetic that appeals to me, and I have always found that their food offerings suited my tastes. I hadn’t been to the Edinburgh one before but I had a decent idea of what to expect. The No 1 Lounge is probably the most central of the lounges in the terminal, although that isn’t saying much. Aspire and the British Airways lounges are tucked away around a corner, about a minutes walk away. My British Airways 767 back to Heathrow departed from a gate opposite the No 1 Lounge, so the BA lounge is clearly not next to any dedicated BA gates. I got in using my Priority Pass, which comes with my American Express Platinum card (or you can buy one) and allows unlimited free lounge visits. It also accepts Lounge Club, which comes with American Express Gold (two free visits per year) or HSBC Premier’s LoungeKey card. The London lounges operated by No 1 Lounges are often very busy and will often refuse Priority Pass walk-ups because they are full. This was not a problem in Edinburgh on a midweek lunchtime. The lounge only had about 10 guests. 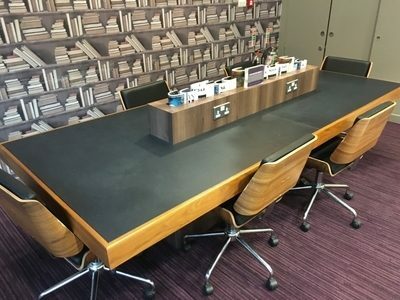 There are four zones – a dining area with formal tables and semi-formal white chairs, an area with table but lower slung green comfy chairs, a boardroom table more suited for working (just visible at top right in my photo) and a very casual sofa-based seating area (top left). It is cleverly laid out with something for everyone. The only thing it lacked was privacy. There are no hidden nooks or corners, which means there is nowhere to hide if your child (or travelling companion!) is playing up. Hot food can be ordered from the bar. You are limited to one hot item per visit – you need to hand over the menu you are given on entry when ordering. Drinks must be ordered at the bar. Standard drinks are free and you can pay for premium options – there was a variety of Moet & Chandon champagnes on offer. If you wanted something to read, there was a small but high quality selection of magazines and newspapers by the entrance. I liked the No 1 Lounge at Edinburgh. 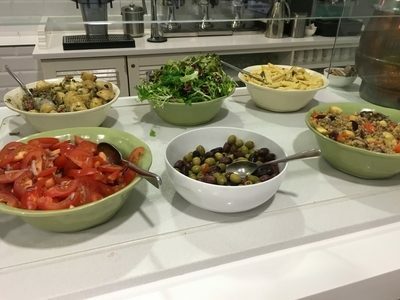 I preferred it to the Aspire Lounge (see my other review) unless you need more privacy or want a hot food buffet, so pick No 1 if you are using a Priority Pass, Lounge Club etc card. It is a closer call between No 1 and the British Airways lounge. The BA lounge, as my review will show, is bigger with more facilities but somehow feels less inspiring, and is a lot busier. 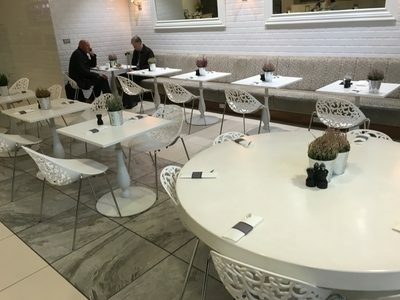 You can find out more about the lounge, and pre-book a cash visit, on the No 1 Lounges website here. Email subscribers to HFP will not have received my review of the Aspire lounge at Edinburgh. If you want to read that, you will need to visit this page of the HFP website. You can pay £5/person to guarantee a space at a No. 1 lounge with Priority Pass or Dragon Pass, I’ve done that before at the LHR T3 lounge to ensure I got in before an overnight flight. 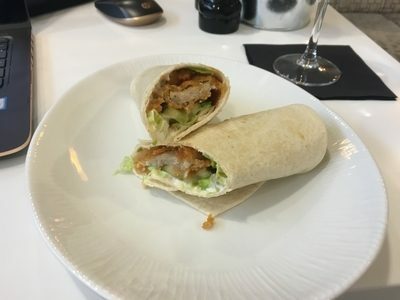 Last time we went through Edinburgh, we started in the BA lounge for a drink (champagne on offer if you asked), popped round to the No.1 lounge for some hot food (BA just has sandwiches and soup), then returned to the BA lounge to await boarding. Worked well! The BA lounge is absolutely rubbish, I always prefer to use the No. 1 lounge when departing EDI and would even place Aspire as #2. Disagree on fast internet – it was terribly laggy on my Citrix session yesterday (and is most weeks). Piggybacked through my phone and was then fine. Never had my boarding pass photocopied or flight details written down @ No.1 but Aspire does ask for flight details. Yes I find the portion sizes of the one hot item No. 1 Lounge will allow you, to be far too small. In the case of LGW No.1 I think they might even be decreasing in size a little more each time I go there. It does feel a bit stingy as the ingredients of their dishes are not expensive. I was in both the BA lounge and No 1 yesterday. The BA lounge was empty but No 1 was very busy. I liked the BA lounge for size, comfort and for the very nice staff but the food was simply dreadful. Same old same old curly edged sandwiches filled with uninspiring content and the usual bits of cheese. I left. No 1 was busier and I sat st the bar and ordered the beetroot and goats cheese salad. The portion size was good and it is made for you and served restaraunt style. They serve draught Peroni and have 2 white and 2 red wine choices. There was also real champagne chilling on ice but something told me it was not free though there were no signs. It was, by some margin, a much better experience than BAs offer though I can see access being an issue at busy times. They had 2-3 people a head of me happy to pay to get in! BA lounges in Europe and away from LHR are now glorified waiting rooms. Food, when it’s available is poor and uninspiring and service non existent, much as it is if you travel SLF class ( self loading freight) on board. There is absolutely nothing premium about flying BA shorthaul other than the price. My flight was delayed yesterday and I looked to see if the earlier service had seats, £266 one way to get nothing on board and no lounge access. It would cost well over £300 to get Club. There was however a bus tour of T5 on arrival adding 30 minutescto the experience. It only took 60 minutes to fly from EDI to LHR. With No1 and plaza now offering serious lounge competition I have to question my need for status. Or as much as £424 one way. The trouble with the BA lounge in Edinburgh is that so many people commute to London on a regular basis that there is a considerable volume with high status. In the old days, BMI had two lounges. From memory it was Silver & Gold, then you went through another door from there into the Diamond(?) lounge. The one through to the right with bmi was for Gold – wasn’t that different but sometimes quieter! It is there to get the long-haul traffic which connects at Heathrow – otherwise people would be tempted to jump on a Middle Eastern carrier or, to North America, one of the US flights that goes direct. Again, very lucky re how quiet it was, is sometimes shut to PP cardholders nowadays. 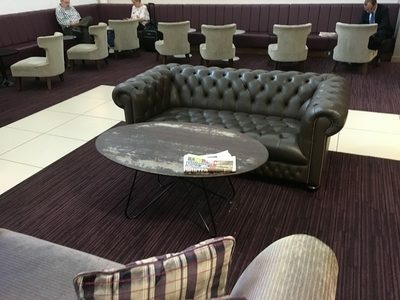 This was the old BA lounge in Edinburgh, before they took over bmi and refurbished their lounge. No toilets in this one, have to go outside and round the corner. If flying BA, Jet2, Flybe this is normally a better choice of lounge for being closer to departure gate. Good tip, how long are the 10 passes valid for & can you use two at once, ie for me & Mrs TripRep? No.1 is always my preferred lounge at EDI, its usually much quieter and the food options are much better than the same old boring sandwiches the BA lounge offers. No it doesn’t have toilets, but that isnt a deciding factor for me! I once actually paid cash to use this lounge. Won’t be happening again. happened to me at the weekend, first time, must be new system. A chap in the lounge asked for 2 bacon rolls (wanted one for the plane), and was politely refused. Out of interest when was your most recent visit? My last one was a couple of weeks ago and they said it was a new policy – I was given a menu upon arrival. Slightly OT. You make an interesting point re dedicated gates at Edinburgh for BA. Flights to LCY often fly from gate 5 which is right across from the BA Lounge, having said that it often seems that easyjet get better gates at EDI – is that because they pay more? In recent months, flying BA from EDI to LCY we’ve ‘departed’ from gate 22 (which is right at the far end of the terminal) – been rammed on to a bus and then driven back to the other end of the terminal. Hardly a premium service. I have a general dislike for EDI airport. They have blocked off the doors which allowed you to walk straight across to the multi storey car park, you have to go out the other set of doors and double back on yourself or walk through the car park to get back to the main entrance (and the lifts). Or follow the signs through to the new building up to the tram entrance to then walk back even more. The security screening system is (to me) stupid and the staff rude, i dont appreciate being barked at when being told what number to go stand on. If you happen to have your tray put on to the rollers at the very back of the line it can take 10 mins to get screened whilst everyone else keeps putting their trays on in front of yours. One day the security queue was back through to the cafes, and staff were shouting to stop queuing up?! If you park in the multi storey and have fast track you get to use the pedestrian bridge which takes you into the staff screening area first, cue staff barking at you to keep walking (some signs would help). The terminal is congested, its a mix of shopping centre and passengers arriving and departing all in the one area, with some of the gates right in the middle of it with passengers having to queue up across the walking area. I agree with all of this ! Quite possibly the rudest, most dis-organised security screening process outside of the United States. I’ve found LHR massively worse, although new First Wing is fine. USA OK when you’ve got precheck, which sadly you can’t get on BA flights. Oz and NZ have much more efficient security for their internal flights, was a breath of fresh air! NZ doesn’t have security at all for some domestic flights!! The BA Lounge is pretty central for he mix of fates they use across the day. The early morning 767’s often leave from Gate 3, which the BA Lounge is closest to compares to the others. Doors opposite multistorey have reopened. I find security staff friendly and helpful, a massive improvement cf LHR! Also prefer the system they have with the trays to the LHR one, at most you’re only stuck behind one person being slow. Lots of pax still inconsiderate and don’t return their trays at both airports though! Oz security is a breeze, and i was amazed that at the Brisbane Domestic terminal they let non fliers airside, just have to pass through security. It did mean however i couldn’t use the lounge as family had came airside with me! At EDI at the weekend i saw someone take their ipad out their bag but place it on top of the bag, to be told ‘that defeats the purpose doesn’t it?’ Meantime staff shouted ‘4’ at me, which i had already worked out on my own. At LHR i sometimes wonder (from the actions i see and general attitude) whether the security staff at LHR are on some sort of go slow – they are often have group conversations which i don’t witness at any other airport. Having worked at EDI airport in central search I am pleased to say that your experience is not one I recognise. Every day, passengers would comment on the friendliness of the security officers, and more often than not, that was from America passengers who can easily be displeased when they are slowed down. In terms of the Welcome Team who control the queue lanes, they are not airport employees but an outsource partner. The airport is growing faster than they can expand and the footprint they can build on is limited. But at least they’ve started work on another extension to add more space around the Gate 12 area. I must say I agree, I’ve not had any issues with friendliness of security staff at EDI. The mandatory duty free visit is very frustrating – esp when time is tight and one is held up behind folk taking their time shopping! Hopefully the new developments will go well. Yes I’d agree with all these comments – Edinburgh Airport has expanded rapidly over the years and has ended up being very poorly designed. The old security system was excellent but was replaced by the new, awful, system to make way for the huge duty free shop. I dislike EDI, had miles to walk just to get into the terminal from the long stay bus drop off, security was unpleasant , barked at by a scurity chap when i gasped and jumped when the security woman put her freezing cold hands inside the waistband of my jeans without telling me she was going to do it first. Then came the long winding walk through WDF with no escape! Slightly O/T but related. Flying QATAR business class from EDI in March. What access do I get to any of the 3 lounges being reviewed? Will drop it in next week, didn’t know it was still live to be honest. Hmmm, shame the 10 passes don’t include the facility for your guest to use one, I don’t think I’ll need 10 in the next year as still have Amex Gold 2x Lounge Club passes + when flying BA CW/CE should have access to their lounges. Will keep my eye on it near Easter to see if its still on then, could be useful for the next financial year. I did this last year. Make sure you put a note to cancel just over 10 months in otherwise they charge you in month 11 for the following year at full price.